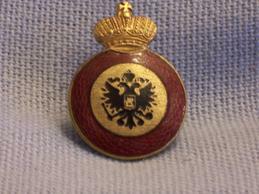 You are looking at a St. Anne fourth class badge for non-christians, instituted on November 12, 1796 and founded by Emperor Paul I. This was actually a subsidiary or Fourth Class of the Order of Saint Anne for non-commissioned officers and enlisted men. The lowest (4th) class of the order was usually called "St. Anne's Weapon Order". A small badge of the order was attached to a steel edged weapon (appropriate to the branch of service of the recipient) inscribed "For Gallantry." The gold edged red ribbon of the order made up the sword knot. 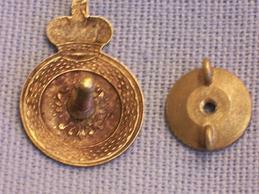 Fourth class St. Anne badge with the screw knot on the back. Slight enamel chipped on the top, otherwise in good condition. Original and rare.